How many times have you heard yourself saying “it’s just a headache” when someone asks you if you’re doing okay? How many times has it felt like more than “just a headache,” but you’ve ignored your pain and pressed on? Has there ever been a time when you couldn’t ignore your headache pains? If you’re someone who suffers from frequent headaches, chronic headaches, or even migraines, often times, taking pain medication or anti-inflammatories and gulping water like a fish won’t provide any headache relief, especially if your body has become accustomed to frequently used medications. Instead of ignoring your pain, writing it off as dehydration or stress, pay attention to your body’s warning signs. Our bodies feel pain for a reason, and if you’re suffering from chronic headaches and migraines, it’s time to listen to your body and get help. We’ll provide chiropractic and massage therapy services that are effective migraine and headache pain relief treatments, ensuring that you have the most effective and long-lasting headache pain relief treatment plan possible. Our chiropractors and massage therapists will help you determine the cause of your headaches, and whether they’re a symptom of some underlying health issue or not, we’ll ensure that your headache pains do not rule your life. If you’ve gotten used to suffering from frequent headaches or migraines, you’re probably also used to popping pills, drinking more water than usual, and trying to sleep away the pain, but you might be finding that these headache treatment methods are no longer working, or they’re just not as reliable as you need them to be. After all, how many days a week can you skip work to sleep off a migraine before you no longer have to worry about going to work at all? Before you reach your breaking point and become truly desperate for a fast and easy headache pain relief solution, try out chiropractic care as a new solution to headache and migraine pains. Stop suffering in silence, and let our spinal adjustments realign your vertebrae, loosen your muscles, reduce inflammation and tension, and relieve your body’s physical stresses so that your head has the best chance possible of feeling stress- and pain-free for extended periods of time. Whether you need headache relief after a long day at work or you’re looking for more extensive headache pain relief that will last for longer than an afternoon massage, we can help you ensure that your headache pain is only fleeting. With massage therapy, we can administer a thorough deep tissue massage, a less intensive soft tissue massage, a gentle Swedish massage for increased relaxation, and trigger point massages intended to treat especially tense parts of your body that need stress relief. Massage therapy targets several systems in your body at once, including your muscular, nervous, circulatory, immune, and lymphatic systems, so whatever might be causing your headaches or migraines, if it’s a problem with one of these systems, our massage therapists can help. Whether you’re too stressed, you have a pinched nerve, or your body needs improved circulation to function properly, massage therapy could be the answer you’re looking for. When you suffer from chronic, or even infrequent migraines, getting through the day and remaining functional can be nearly impossible. Migraines cause such severe pain that many people are incapacitated for entire days at a time without pain relief, waiting for a migraine to subside. There’s no reason to be one of these people. If you’ve never been diagnosed for migraines or you’re not sure whether you’re suffering from a headache or a migraine, look to your pain to know whether you’re experiencing headache symptoms or migraine symptoms, and don’t wait to seek treatment simply because you’re not sure if you’re experiencing headaches or migraines. No matter the cause or severity of your pain, your headache treatment is an important part if helping you lead a happy, healthy life, and recognizing your migraine symptoms for what they are is an important step in beginning your migraine treatments. Migraines are characterized by intense pain, usually lasting for several hours at a time. Although some patients suffer worse than others when experiencing migraines, the symptoms are have similarities. A migraine can be described as an intensified, incapacitating headache, and its symptoms may include dizziness, nausea, and sensitivity to light. Often, the combination of one or more of these symptoms will drive you to spend hours or days lying in a dark room to avoid painful lights and sleeping off the pain and nausea that you feel when you move, stand, or see light. As bad as migraines, sound, fortunately, there are natural treatment methods designed for migraine pain relief, helping you function normally and preventing future headaches and migraines. With chiropractic care and massage therapy, our center will help you relieve stresses on your body, ensuring that you are as relaxed as possible to combat any mental or physical stresses that could be causing your headaches or migraines. 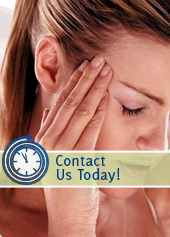 Call our center today at 651) 255-9999, and begin your natural headache or migraine pain relief treatments today. I suffer from tension headaches and severe migraine headaches. I have tried everything under the sun to help. The adjustments along with the new Cold Laser Therapy have been my best weapon against my debilitating headaches. Thanks Dr. Matt & Dr. Marty.